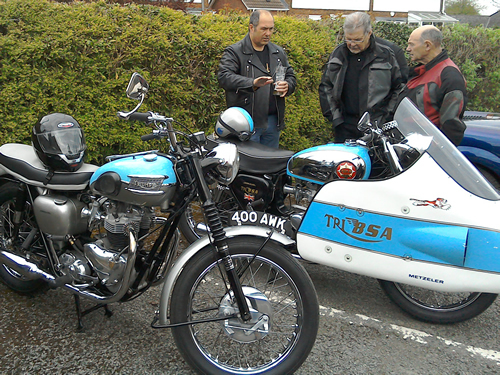 ​ The Friendly Inn always provides a nice place for an informal midday gathering of riders and machines. Some members decided to stay for a Sunday Lunch but most of us opted to gather in the car park and talk bikes. On this occasion we were also pleased to welcome 3 new faces for our Sunday gathering, amongst the Triumph, Ariel, and Cotton motorcycles was Franks very nicely turned out Villier's powered Sun motorcycle ...Sun glasses and earplugs optional. Our thanks go to Frank Parker for organising the event and to Nigel and Deb our hosts at the Friendly Inn for their hospitality.